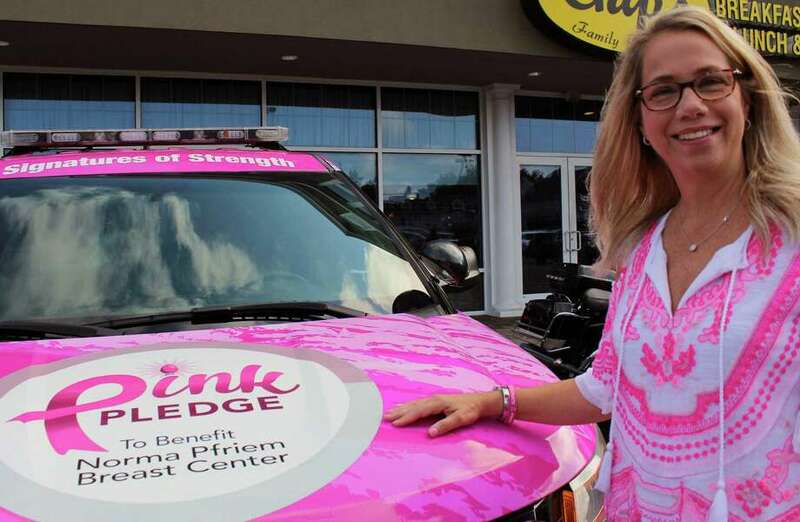 Marlene Battista, one of the co-chairwomen of the Pink Pledge campaign, stands next to the pink police cruiser that will be seen around town during October, which is Breast Cancer Awareness month. FAIRFIELD — The town is awash in pink these days — pink banners, pink ribbons, a pink police cruiser and Public Works crews sporting pink shirts. The reason is because October is Breast Cancer Awareness month, and Marlene Battista is one of the women coordinating the pink explosion and urging residents to take the Pink Pledge. Battista is the original Pink Pledge chairwoman, serving since 2015, and this year she is assisted by Meghan McCloat and Amy Desel. Named Fairfielder of the Year in 2016, Battista is not afraid to get involved, and took on the job of orchestrating the town’s gala ball during its 375th anniversary. Battista serves on the Strategic Plan Committee. She recently answered some questions about the Pink Pledge fundraising and awareness campaign of the Norma Pfriem Breast Center. Q: What is the goal of Breast Cancer Awareness Month — is it to get women to have mammograms, raise money for cures, raise money to help those dealing with cancer? A: I think the goal of breast cancer awareness month is really all of those things encompassed into one month of passion, hope and a really powerful mission. The concept is simple: Do what you can to wear pink, give where you can, remind others of the importance of breast cancer awareness and to remember the importance of supporting those who go through this. As a community each October, we focus on the fact that there are people that fall into all of those categories: there are patients, there are survivors, there are their support systems, and then there are advocates for the cause. Breast cancer awareness matters for all ages, for men and women, and all backgrounds. Although every October we focus on blazing through the town, painting it pink, it’s because we want to make it so obvious that none of us forget that we have the access to affordable annual screening and that the importance of keeping on track with those screenings is life-saving. When a community can come together the way that Fairfield does year after year to surround themselves around a common cause that impacts us all in some way, it’s really a wonderful reminder of why this town is so special. Q: Who are some of your partners in turning the town pink, and how are they helping? A: Pink Pledge is a monthlong, communitywide awareness and fundraising campaign to benefit the Norma Pfriem Breast Center. Funds raised through Pink Pledge enable the breast center to continue to provide medical excellence, compassionate care and life saving programs to all women and men regardless of their ability to pay. We have so many wonderful partners supporting us. Our Pink Pledge partners include merchants restaurants, fitness centers, schools, both public and private, and corporations. Our tag line is “Shop, Dine, Sweat or Donate” — we want to give everyone a chance to participate in supporting Pink Pledge in a way that works for them. Each partner supports us in a different way, be it a special fitness class, some restaurants offer a special pink drink for the month or a special item like a pink cupcake, while others might have a give back day where a percentage of the day, week or month proceeds are donated to Pink Pledge. Schools show their Pink Pledge spirit by having a pink dress down day or a crazy dress pink day, locker decorating contest. Some sell special T-shirts to the whole school. It’s amazing to see the different ways our partners come up with to support Pink Pledge. We tell our PP partners to do what works for them. Many of our Pink Pledge partners have been supporting us since 2015 when Pink Pledge was launched in celebration of the Norma Pfriem Breast Center’s 15 year anniversary. Donna Twist, executive director of the Norma Pfriem Breast Center and vice president of development for the Bridgeport Hospital Foundation, wanted to so something to recognize the amazing support the community has shown to the breast center over the years. It was intended to just be a one-and-done celebration, and the support was so overwhelming and our community really got behind this great cause we decided to continue to do it again the next year and it’s just grown exponentially with each year. Pink Pledge has raised over $450,000 in total, in 2017 the campaign raised $150,000 and we hope to raise even more this year through the generous support of our community. We have a Pink presence in Westport and Bridgeport as well. New this year are the pink carts, which you’ll see all around Fairfield through our partnership with Big Little Sanitation Co. We sold out of 400 pink carts in a week — we still have people asking how they can get a pink cart. We try and think of new and innovative ways to continue to expand our pink presence in the community. Also exciting, we were chosen to be Charity of Choice for the Fairfield Uncorked Wine Festival presented by GoodWorks on October 20 at FTC, and the Fairfield Country Day 5K race happening on Nov. 4. Another example of the strong support in our community. Pink Pledge would not be possible without the commitment and generosity of all our sponsors, some who have been supporting Pink Pledge and the Norma Pfriem Breast Center for many years like Paul Miller Nissan, Bigelow Tea, People’s United Bank just to name a few. We are so grateful to all our sponsors for all they do to support the patients. All the pink you see around town — lamp post banners, building signs, pink feet, pink cars — it’s all made possible by our sponsors. There are no taxpayers dollars used for anything. Q: What are some statistics you think everyone should be aware of? A: According to Dr. Mary T. Pronovost, medical director of the breast center, one out of every eight women get breast cancer here in Connecticut, and the rate of invasive breast cancer cases among Connecticut women is the second highest rate in the country. Only 5 to 10 percent of breast cancers are linked to inherited genetic mutations. Q: How did you get involved in promoting breast cancer awareness? A: I became involved as a volunteer with the breast center about six years ago when I joined their President’s Council and served on the NPBC Advisory Board. My co-chair Meghan McCloat, of Easton, joined the President’s Council in 2016 and immediately jumped right onto the Pink Pledge band wagon, and Amy Desel of Fairfield has been a volunteer and President’s Council member since around 2016 too, I think. It takes about eight months to put the campaign together and many volunteer hours to make it the success that it’s become over these four years. Q: I know the men of the DPW don pink shirts — how important is it for men to be involved? A: It’s important for men, and everyone, to be involved. But many think only women can get breast cancer — not true, men can get it too — the percentage is 1 percent but it still happens, so we add the blue ribbon to the police cruiser to acknowledge men too. We have support from our Public Works Department, Fairfield Police Department, Fairfield Fire Department, Parks and Recreation and Economic and Community Development, as well as the first selectman’s office. All our town departments and employees are very supportive of this cause because we all know someone who has been touched by breast cancer. They have shown their support with pink hats and pink shirts, by driving pink vehicles. They are there to show their support, not only for breast cancer but our town gets behind many important causes. I am proud to call Fairfield home. It’s been an honor for me and my co-chairs to be involved with Pink Pledge. It takes a village and we are so grateful to everyone for supporting the Norma Pfriem Breast Center. Support makes all the difference in the world.